Here is a photo of a waterfall in Hamilton, Ontario, sent to me by Vince. 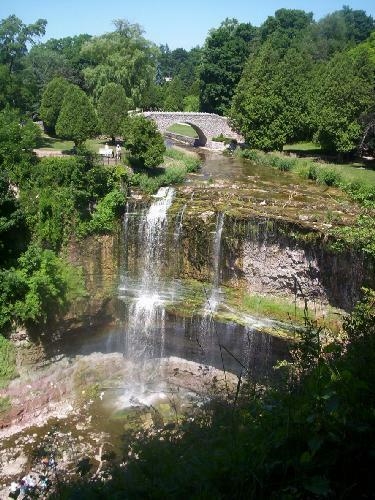 There is info about more falls in the area at http://www.conservationhamilton.ca/parks/visit/Websters_falls.asp . Vince also sent me a photo of another waterfall in lower Michigan. He said, "During a recent hike to look for caches, we stumbled upon this unknown little waterfall we found in western Ottawa County in the lower Penninsula." Here's additional information from Vince about the location of this waterfall: "It is in a little park called Sheldon Landing. You can see it from car. It is unnamed with a fall of about 4 ft. Cute little waterfall. It can be located at N 42° 54.198 W 086° 11.746." I received informatio about another waterfall in lower Michigan from Tony: He said: "
MANISTEE RIVER TRAIL WATERFALL (also called Hidden Waterfall on one site). 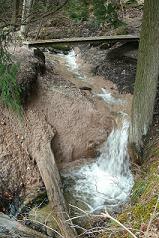 This is a small fall with a drop of about 2 feet (with additional subsequent rapids) on an unnamed tributary to the Manistee River just downstream of the Hodenpyle Dam, southwest of Mesick, MI. Located at 44° 21 16.72 N 85° 49 48.59 W, this waterfall was discovered when the Manistee River Hiking Trail was laid out on the east side of the river (the famed Little Mac hiking suspension bridge across the river is upstream of the tributary with the waterfall). A foot-bridge for the Hiking Trail actually crosses the stream right at the fall. The waterfall is unique in that it was formed from water falling over a layer of clay (instead of the normal rock). Hikers can park at the campgrounds or road end on the east side of Hodenpyle Dam and follow the Hiking Trail for about 2 miles south along the east side of the river to the falls. It is also possible to drive within ½ mile of the falls and follow a marked trail to the falls: On M37 south of Mesick, turn west on W 26 Rd (also signed as Forest Road 9067). Go 3 miles to the intersection with FR 9990 (labeled on maps as E County Line Rd or No 1 Rd). Turn north on FR 990 and go ½ mile to FR 7123 (labeled on maps as E Sweets Ravine Rd) Turn west on FR 7123 and go ½ mile to intersection with FR 7120 (labeled on maps as Blueberry Ln). FR 7123 continues on just a few feet and ends at a gate with a sign for the falls where you can park a car. The foot trail continues on past the gate another ½ mile to the falls. All of the Forest Roads are unimproved dirt roads, but are passable by most vehicles with normal ground clearance. As this fall was created by water running over a layer of clay, it is gradually eating away the clay. 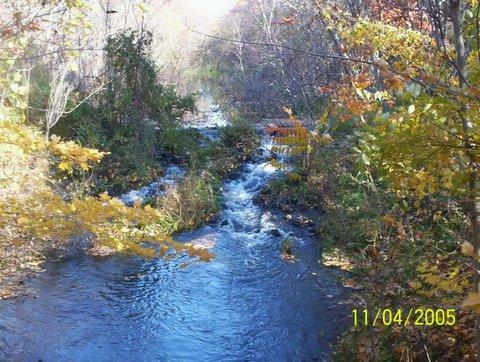 There has been a noticeable decrease in the fall from when the Hiking Trail was laid out in 1996 (a winter picture can be found at http://www.michiganbackroads.com/Attractions/hiddenfalls.htm) to when the accompanying picture was taken in 2013. Without some stabilization, the fall will continue to change. Page last updated 25 Apr 2013.